Preparing for a hiking holiday in Ireland? 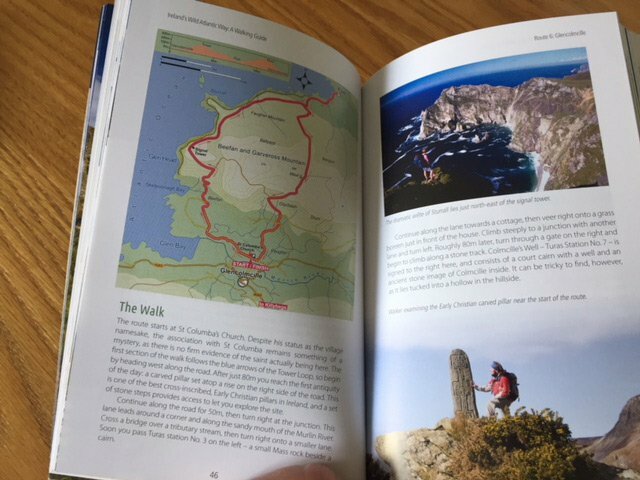 Much as we enjoy the actual physical hike it is also a pleasure to sit and spend some lazy time reading up on the best walks in Ireland. Plan your trip to Ireland around the best hiking trails that will also take in some of the great discovery points along the Wild Atlantic Way. Whether you are an experienced hill walker or just looking for a couple of good easy routes to get you off the beaten track then you will find this guide Ireland’s Wild Atlantic Way, A Walking Guide by Helen Fairbairn an invaluable resource. Read our review of this guide book below and for a limited time, if you Like and Share our Facebook page you will be in with a chance to win a copy of the book for Free! This walking guide details some of the best hiking trails in Ireland. It was originally published in 2016 and reprinted in 2017 and again in 2018 which serves as testament to it’s popularity. The book itself is sturdy and pocket sized with 168 pages. It details 30 separate routes in counties Donegal, Mayo, Galway, Clare, Kerry and Cork. The walks are graded from 2 to 5 with 5 being the hardest. The Grade 2 walks follow signed paths but may not be constructed underfoot and may involve some moderate gradient (up to 200m vertical ascent). Whereas a Grade 5 route would be a strenuous hillwalk perhaps with multiple summits and of a duration of at least 5 hours. 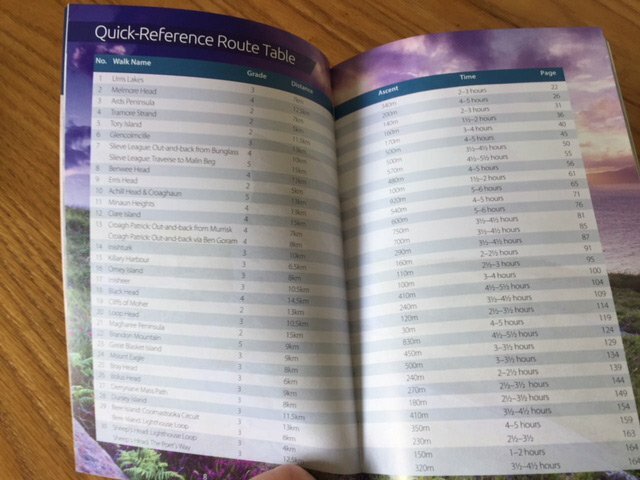 Each of the 30 routes has a number of pages with a detailed description, images and a map. The book also includes useful information about the natural and human history of the Atlantic coast and practical guidelines about when to walk and recommendations on what OSI (Ordinance Survey of Ireland) maps might be useful. Don’t forget that for a limited time, if you Like and Share our Facebook page you will be in with a chance to win a copy of the book for Free!